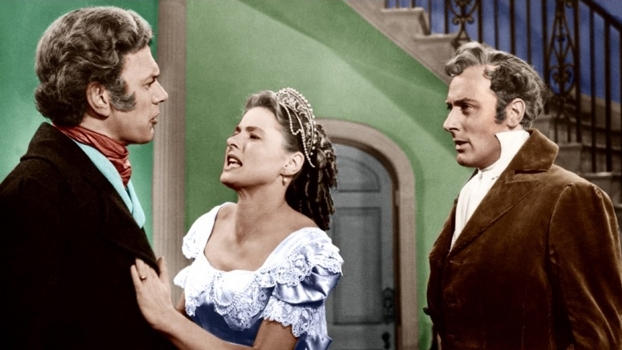 After a successful career in Sweden during the 1930s, Ingrid Bergman moved to Hollywood for the remake of her Swedish hit Intermezzo: A Love Story (1939). Bergman signed a contract with David O. Selznick. Two of Bergman’s films for Selznick were with Alfred Hitchcock: the psychological romance Spellbound (1945) and the stone cold classic Notorious (1946). During the filming of the Italian film Stromboli (1950), Bergman entered into an adulterous affair with director Roberto Rossellini. She left both Hollywood and her husband Friedel Pia Lindstrom for Rossellini. The scandal nearly sank Bergman’s Hollywood career. The negative publicity affected Hitchcock’s third film with the actress Under Capricorn, a financial disaster and critical disappointment. While it isn’t fair to blame Ingrid Bergman completely for the film’s failure, her affair shifted the public opinion of her. Bergman was regarded as an ideal woman—elegant, vulnerable, a classical beauty. For her to abandon her career and her marriage for an adulterous relationship was shocking. Bergman eventually returned to Hollywood in the late 1950s, welcomed with open arms. Now, people understand her better as an individual, taking her off a pedestal. The publicity storm surrounding Bergman contributed to Under Capricorn’s failure, though I’m not sure the film would have been a success under different circumstances. The timing of the film with Bergman’s affair was a perfect storm of disparate bad circumstances coming together. Removed from Hollywood gossip, Under Capricorn is at times quite interesting to behold and at times a drag to get through. Based on the novel of the same name by Helen Simpson, the film stars Michael Wilding as Sir Charles Adare, who arrives in colonial Australia to make money. He enters into a business deal with Sam Flusky (Hitchcock favorite Joseph Cotton), a wealthy ex-convict. Sam is married to Charles’s childhood sweetheart Henrietta (Bergman), now an alcoholic on the brink of madness. As Charles becomes closer to Henrietta and Sam, he learns the dark secret of how they ended up in Australia after fleeing Ireland. There are many elements that suggest why Hitchcock was interested in this story. The film could be played as a cross between Notorious and Rebecca. The alcoholic heroine, the imposing mansion, a controlling maid, a man wrongly accused of murder. These are classic Hitchcock elements. The problem is that the film is executed like a domestic melodrama, and a not very interesting one at that. The mysterious plot points are doled out with little suspense, and Under Capricorn comes off dull and staged. If Hitchcock had leaned into the thriller elements more, perhaps with some expressionism, then the film would be more enticing. As it is, it’s a fairly rote drama that teases a mystery with none of the Hitchcockian payoffs. Under Capricorn does have some interesting visuals. The great Jack Cardiff, whose lavish use of color is famous, shot the film. Together he and Hitchcock create a number of striking long takes that weave in and out of rooms and around the sprawling mansion. Under Capricorn was the second color film for Hitchcock after Rope, and he wanted to do the film in all long takes like the earlier film. That proved too difficult, so he could only do a few sequences. The long takes are the most interesting part of the film. It’s the only thing that allows me to believe that Hitchcock was awake on set. Otherwise, the direction is tame and uninteresting. The famous French film magazine Cahiers du cinema cited this as one of Hitchcock’s best films, and I imagine that was for the beautiful camerawork. But I don’t quite consider Under Capricorn an underrated gem. Ingrid Bergman does good work but she seems suffocated. Michael Wilding is no match for either of his co-stars. And poor Joseph Cotten looks bored to tears (rumor has it he called the film “under corny crap”). This was the third in a string of flops for Hitchcock; it has some really excellent moments but does not truly come together as an unsung classic.